The Westmeath section of the Galway to Dublin Cycleway extends from the existing Royal Canal Greenway in Mullingar to the town of Athlone. While the route of the Royal Canal Greenway extends north of Mullingar towards Coolnahay, the route of the Galway to Dublin Cycleway branches off from the canal towpath and joins the former Mullingar – Athlone railway track. This section amounts to a 42km section of the proposed 277km of the overall Galway to Dublin Cycleway travels through the scenic landscape of County Westmeath via the settlements of Castletown Geoghegan, Streamstown and onto the town of Moate before arriving in Athlone at Whitegates. The route has been identified as a significant marketing tool in the promotion of Ireland as a cycle destination. It will form part of the greater trans-European cycle route, EuroVelo 2, linking the capitals across Europe. A long distance cycling trail that caters for multi-functional use, including walking and running, and water transport where it aligns with the waterways network. A traffic free environment, with good traffic-free connections into key towns along the corridor offering a range of services. A means of accessing a range of activities, attractions and events along a 200+ kilometer corridor stretching between Dublin and Galway. A tourist amenity with a strong brand identity, supporting independent travellers and guided tours, and adopting the best features of similar destinations worldwide. Good access to and from the trail at intermediate points by public transport. A local resource, for walking, cycling and water-based activities. The Cycleway will be an important national tourism asset, attracting walkers and cyclists from all over Ireland, Europe and beyond. It will also provide recreational opportunities for local communities along the route. The Westmeath Section of the Galway to Dublin Cycleway is being progressed in five sections. The first section, The Royal Canal Way, comprising of 22km is open from the Meath County Boundary to Mullingar (Newbrook). The second section, comprising of 42km is along the existing disused Mullingar to Athlone railway line, commencing at Newbrook Mullingar and finishing at Whitegates in Athlone. 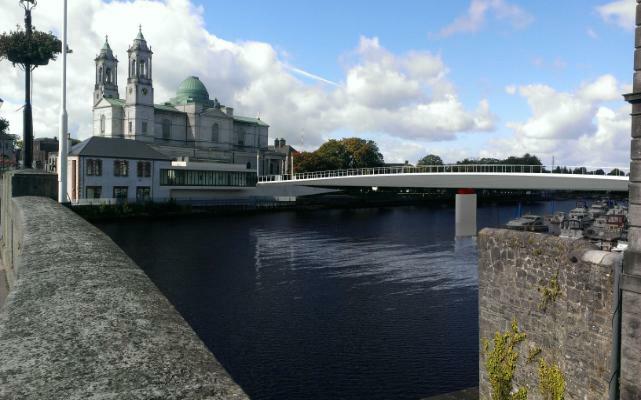 The forth section isto the west of the Marina Building where, an exciting route has been developed to cross the River Shannon with a new bridge and link to Athlone Castle where the development of a new cycle-hub is planned. The final section from Athlone Castle to the Roscommon border is currently paused.